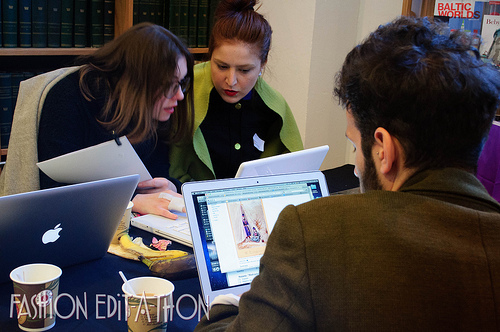 On 22 March 2013, Europeana Fashion hosted its first in a series of edit-a-thons in collaboration with Europeana Awareness, Wikimedia Sverige and partners Nordiska museet and Stockholm University Centre for Fashion Studies. Erwin Verbruggen from partner Netherlands Institute of Sound and Vision reports! An edit-a-thon, for those unfamiliar with the term, is a concept coined by the Wikipedia community. An edit-a-thon is an event during which people come together to edit and contribute new information to Wikipedia. But when you have never before written or edited a Wikipedia article, it can be a frightening undertaking: zillions of possibilities, millions of topics, plenty of buttons and quite a few ways to get them right. An edit-a-thon helps: by bringing together volunteers from the Wikipedia support organisation and a crowd of people knowledgeable about a certain topic. Formerly inexperienced people can be turned into encyclopaedia writers in less than a day. And so everybody wins: the Wikipedia community gains much-needed helping hands and the world at large receives expanded knowledge about what it is that the edit-a-thon is about. In our case, of course, that is fashion! Throughout the length of the project, we are setting up 5 of these edit-a-thons to invite the fashion community over to one of Europeana Fashion's partnering museums and join the worldwide knowledge machine. 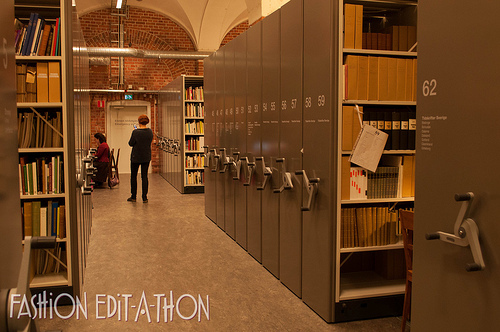 The first of these edit-a-thons took place at the library of Nordiska museet. The museum hosts an impressive library, which made it the perfect location for the participants of our edit-a-thon. As Christer Larsson, Nordiska's librarian, told us, the library holds 60 metres of fashion magazines and is often used for research by Stockholm University's Centre for Fashion studies, And so amongst these resources, our fashion expert started writing. As a source of inspiration, Europeana Fashion partners Nordiska and MoMu made a selection of images available on Wikimedia Commons. We are trying to make as much material as possible available for use and reuse on Wikimedia Commons platform, so keep an eye on the Europeana Fashion category to see this collection grow over the upcoming months. 47 participants registered their attendance at the Nordiska museet (50 had signed up in advance). Also, a few Wikimedia volunteers worked with the material online, without signing up. 57 out of 362 uploaded pictures from Nordiska museet are now being used on Wikipedia, in total 72 times on different language versions. This is however not the the end of it, as many participants started writing articles and published them the following days and kept expanding them. Articles were edited in 8 languages, of which English and Swedish were the most common ones (the others were Polish, German, Finnish, Spanish, Russian and Italian). To see all this writing in action, you can browse the 73 pictures that were taken and uploaded to Wikimedia Commons during the event or view the timelapse! We are very happy about the outcomes of the day and look forward to further cooperations with the worldwide Wikipedia community. You can already buckle up for the next edition, which will be held on 13 May 2013, at the Centraal Museum in Utrecht (NL) and is organised in collaboration with the Netherlands Institute for Sound and Vision and ModeMuze. Find more information (in Dutch) at the Event page on Wikimedia Netherlands. 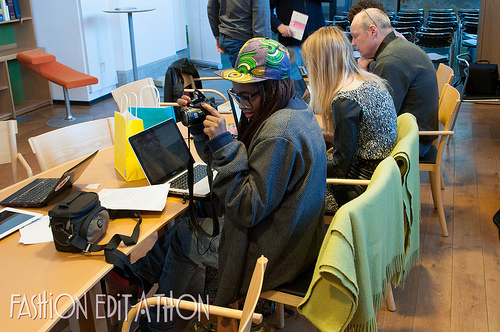 This report on the first Fashion Edit-a-thon, which was held on March 22nd, 2013 at the Nordiska Museet, Stockholm, was written by Erwin Verbruggen from the Netherlands Institute for Sound and Vision. The author wishes to thank the Nordiska team and Wikimedia Sweden - in particular John Andersson for crunching the numbers until his hairs turned grey! 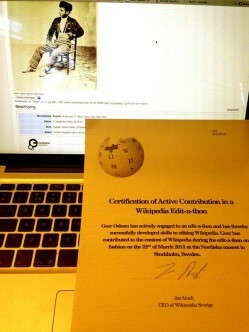 Certificate for participation in a Wikipedia Edit-a-thon. Crave one yourself? Then join us for the next Fashion Edit-a-thon in Utrecht on May 13th!